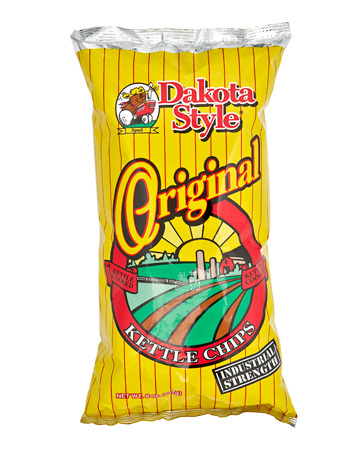 If we ignore the other flavors in the Dakota Style range and focus on this as a standalone bag - it is their best. The yellow coloring with thin red stripes, plus their fun and friendly potato on a tractor logo, makes it an inviting design. The cartoon landscape works really well, and although a bit 1990s, it still looks fine. These are not 'Industrial Strength' as Dakota Style would like you to believe. That conjures up the wrong image entirely. Instead, these are the perfectly balanced, soft and brittle crunch that makes your mouth water for more. A crunch to compare all Chips to. These are among the most aesthetically pleasing Chips we have reviewed. They are potato colored; not yellowish in color, as Chips would generally make you believe a potato is colored, but creamy white. They have craggy and curled edges and some were bent over. A few have an orange tinge to the edges and there is little seasoning visible. They are a little oily, but these are Chips, not paper towels! 'Original' usually means, plain, unsalted, unseasoned, lacking in flavor - a bit pointless unless it is accompanying an all singing and dancing sandwich that can handle the pressure of providing the diner with flavor. These however, had more oily potato with a touch of salt flavor than the vast majority of plain and boring Chips.